Last August four women became fully ordained nuns in the Theravada tradition at a ceremony in California. Amy J. Boyer reports on this North American first. As I listened to nuns and monks from all over the world, united as they chanted Pali in both women’s and men’s voices, I felt as though a centuries-old wound was healing. Under the redwoods of former logging land, gradually restoring itself, four women were being fully ordained as bhikkhunis (nuns) in the Theravada tradition. Full ordination was for centuries unavailable to Theravadin women. On this last Sunday in August, these vows were bestowed by a dual ordination—the first in North America—that included an assembly of fully ordained Theravada nuns. Nearly two hundred people gathered for the ceremony at Aranya Bodhi forest refuge in Sonoma County, California, coming from as far as New Zealand and Canada. Ayya Tathaaloka, the abbess of Aranya Bodhi, was the preceptor for the ceremony and Bhante Henepola Gunaratana, the abbot of Bhavana Society, was the presiding elder. To begin the communal meal, Ayya Tathaaloka invited Bhante Gunaratana to accept the meal on behalf of the monastics. He responded by asking that one of the women accept the meal, and Ayya Sobhana was chosen. This was a lovely, unexpected gesture because the monastic order places seniors ahead of juniors and men ahead of women. Afterward the monks and nuns assembled for the procession into the meditation hall, while Ayya Tathaaloka spoke on anumodana, the happiness of seeing virtue in others, and about the long road that led to this moment. In a way, she said, it had begun at a retreat at Spirit Rock Meditation Center in Woodacre, California, where people had seen her in robes. “It seemed that every time I went to sit there was a note slipped under the cushion,” she said, “and every time I went to the bathroom there was a woman who wanted to whisper to me, ‘How is it that you’re in robes? Is this something I could do?’ So I felt that there was strong aspiration.” Thus began her determination to establish a residence where women could ordain and practice as monastics. She then invited others to speak. Ruth Denison, one of the first women to teach Buddhism in the West, spoke about interconnectedness, noting that the offer of land for Aranya Bodhi was made at Dhamma Dena, her desert retreat center at Joshua Tree in Southern California. Sylvia Boorstein read a card from Jack Kornfield saying that Spirit Rock gave its wholehearted support, along with a Kuan Yin statue and a promise of a heating system for the yurt. Next, the barefoot monks and nuns filed up the former logging road while guests showered them with flower petals. The samaneris (postulants) came last, flanked by Ayya Sudhamma and Ayya Sobhana, who were the kammavacacarinis(advocates). They would question the samaneris and request that they be ordained. Then the ordinations began, conducted in Pali. 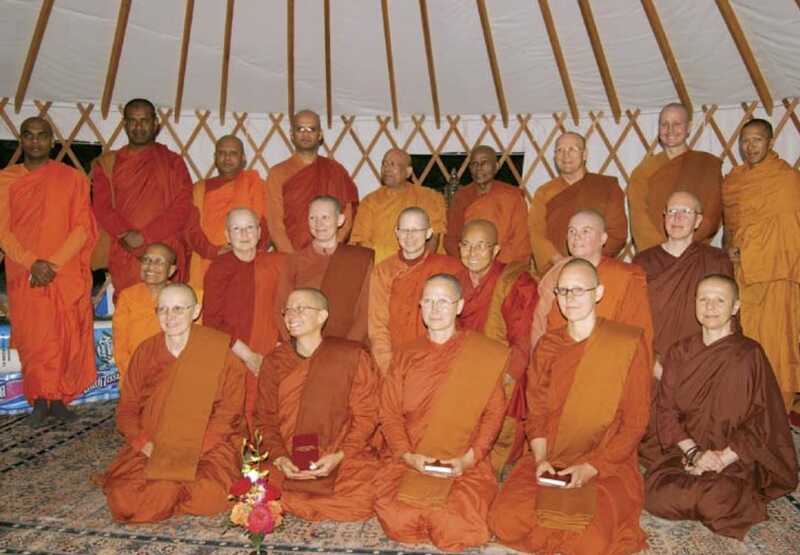 Each samaneri was ordained both by the bhikkhunis and the bhikkhus, making it a dual ordination. Originally, three samaneris had planned to take the vows: Suvijjana, who resides at Aranya Bodhi; Adhimutta, from New Zealand; and Phalanyani, from Germany. However, Ajahn Thanasanti—formerly of Chithurst, England, and now based in Colorado Springs—had been discussing ordaining with Ayya Tathaaloka. Upon arriving at Aranya Bodhi, she saw how the bhikkhuni sangha sincerely welcomed her to join them, and she also decided to ordain. 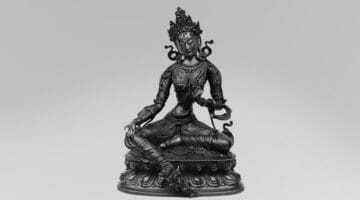 Each samaneri slowly approached Ayya Tathaaloka and the other bhikkhunis with an offering of flowers, a candle, and incense, and thrice requested dependency on Ayya Tathaaloka, who pointed out the requisites the samaneri brought: an alms bowl and set of five garments. At that point, Ayyas Sudhamma and Sobhana took the samaneri aside and asked her a series of questions. Each samaneri then requested ordination from the sangha, and waited outside the circle of bhikkhunis while Ayyas Sudhamma and Sobhana formally requested her ordination three times. When none of the bhikkhunis objected, Ayya Sudhamma told each samaneri to come in. The questions and answers were repeated before all the bhikkhunis and the ordination was pronounced. Elder and new bhikkhunis broke into delighted smiles amid some tears. When all four had completed the rite, the new bhikkhunis went together to the other side of the hall to request ordination from the bhikkhus. This was a much shorter ceremony: the male kammavacacaryas requested ordination for the bhikkhunis and the bhikkhus granted it. The ceremony concluded with a talk by Bhante Gunaratana. He noted that in his seventy years as a monk, this was the first dual ordination he had seen and the most women he’d seen given full ordination at once. A longtime supporter of women’s ordination, he was proud that two of his disciples—Ayyas Sudhamma and Sobhana—were serving as bhikkhuni advocates. Over the years he had ordained novice women at his Bhavana Society, he said, but “we[had to] send them to Sri Lanka for full ordination.” Even then, only a few monks were willing to ordain women. For me, it was an amazing, inspiring day. Witnessing the tiny number of bhikkhunis being increased by four gives me hope that the women’s wing of the sangha will grow strong in America and become a resource for the world. See also: “The Time Has Come,” on the full ordination of women, and “Making Our Way,” a forum discussion on women and Buddhism. Amy J. Boyer is a writer and editor living in Winters, California.